It is the television phenomenon of the year. The very last episode of Breaking Bad. Social media has been ablaze with speculation, anticipation and delectation as people from all four corners of the globe scramble to watch it live, stream it or grab a download. As George Osborne redefined the welfare system and the US Government spiralled towards shutdown, there was only one subject on the airwaves of the Zeitgeist. How would it end? As people unfriended others on Facebook for dropping plot spoilers and barrages of abuse were directed toward anyone even slightly giving the game away, watching the final episode of Breaking Bad almost seemed to take on a ceremonial quality. And in keeping with the Breaking Bad themed start to the week, and to give that ceremonial atmosphere an extra hint of the special, a recipe has emerged from the people at Sous Chef. Blink and you’d swear it was Heisenberg’s very own special cook up of crystal meth. 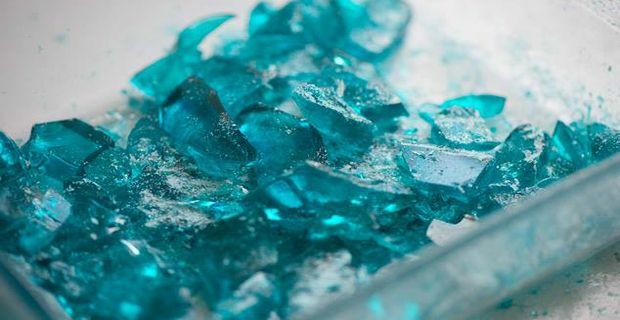 But in fact it is nothing of the sort, it is in fact a sweet edible treat with an edge, and guaranteed to bring Breaking Bad to life. When heated to 170°C and then cooled, the isomalt in the dish will turn into a slab of glass all ready to be shattered, bagged up and nibbled on as the credits roll. 2. In a pan heat the isomalt and water to 170°C with the help of a sugar thermometer. 3. Add a few drops of blue food colour. 4. Pour directly onto the baking paper. 5. When the isomalt has cooled, break it into crystals with a hammer or rolling pin.